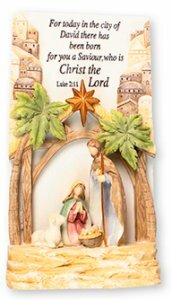 DIVINE CHRISTIAN GIFTS - Nativity Plaque City of David. Nativity Plaque City of David. City of David nativity plaque with holy family and baby Jesus. Size: 6 3/4" high made of resin and comes boxed.